Since I have been doing all this talking about WordPress 3.0, I thought it only fitting to start incorporating some if its features into my themes. The first theme to get the upgrade is Magazine Basic. Version 2.6 also has the Arturo Theme Engine v2.0 installed to give a smoother experience while configuring the theme options. The new MB is currently available for download off of WordPress.org. The new 2.5 version of Magazine Basic has a number of issues with the layout and I’d like to go back to using the earlier version (for instance, MB 2.5 doesn’t recognize parent vs. child postings in the nav bar.). Are earlier versions available anywhere for download? I think I’ll try this theme on the next site I create. What does “Superfish” menu mean btw? I am using MB for couple of wordpress sites I maintain and I love it. I need a bit of help with the following: how can I preserve some basic formatting (e.g., text decorations for links, italics etc) on the front page? I have worked my way through the style.css file but I was not able to find where/how the formatting is suppressed for the front page. Very nice and clean theme. Did you in new version of Magazine Basic v2.5.4 have solved issues with v2.5 mentioned above? Very nice one -Thx ! I’ve just a question, I don’ understand how is setted the leftcontent (in the mainwrapper) ? I’m trying diferent themes ande I think I like MAGAZINE BASIC the most. 1) POST’S “TITLE” AREA – How can I change the FONT SIZE in a post’s Title Area? 2) Also – In the actual post area, when I aqply “Heading 2” or “3”. the size is changed, but not when I see the post on the front page?? The font size in controlled by the style.css file. You need to edit the CSS in that file to change the font size. If you are using the excerpt for the front page, it will strip all your tags. Use the content instead. Where in the CSS file. There are many instances of “post” and “font”. I basically want the post “title” to be smaller on my front page. I went to the Style.css file, but I don’t know exactly where to change the font size. You are look for .ind-post h1, .twopost h1 and .threepost h1 in the style.css file. .ind-post h1, .twopost h1 and .threepost h1 in the style.css file. I changed the font sizes and still- on the FRONT PAGE the font size in the MAIN POST TITLE does not change. The size of that first post title is too large for my tastes. I would need to see the site. What is your URL? I am keen with your MB theme and should be very keen to be one of your five. Is it possible for you to create a few more page templates, for example a Blog/Discussion format that looks more classically blogish? The benefit of this is that pages where comments are turned off of regular posts that are quality content not for commenting on, can be left tidy and the discussion blog can look more traditionally blogish? Hey, it’s a nice magazine theme, but I think if you try a bit harder and add some widgets on lower area then it can look much better, also Does it come with admin options? It’s got options up the wazoo. If you go to your categories page and hover over one of the categories you should see the ID in the bottom of your browser. If not, click on a category and you will see the ID in the address bar. It looks very professional. Amazing how wordpress can be customized. having trouble with the catagories on menu bar.i have some long catagorie names and only 8 will show on the header menu bars. i installed the theme, like it, but the layout gets disrupted when i install the wordpress.com stats plugin – the rightmost column slips under the other one. can you please help me solve this? thanks in advance! Looks good to me in Firefox 3.6. If you are still having this issue in other browsers I suggest just hiding the little smiley face that appears from the Stats plugin. i used this themes, look great.. very clean, buti got a problem.. how to appear the pic on frontpage? 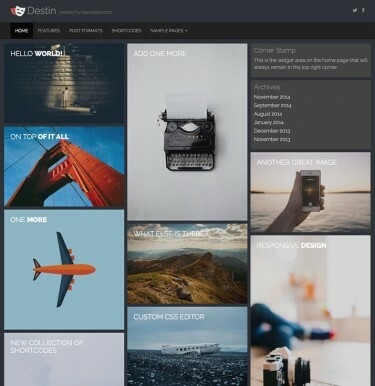 I am using Magazine Basic on wordpress. I am having a problem getting the second sidebar to work. I am trying to get one on either side. The second one is showing up below the first one. Any idea? I love your magazine basic theme and use it on a couple of my blog sites. On http://www.sellingtogiftshops.com, I have the older version. Lately, I have noticed that my category lists in the side widget and in the header are not showing. Thinking the problems was due to using the older version, downloaded the newer version(2.5.6) but when I try to upload it to my site – either through the blog itself or through my ftp program – I am told that the upload failed. I am not particular about having the new upgraded version, but would like to have my categories listed again. suggest to update your version of your theme, it’s like WordPress you should always use the latest version. I am using this theme on several sites in Germany and it is indeed very clean, looks great and is easy to handle/edit. I’m using the version 2.4.2, which works very stable. If I try to upgrade or install to 2.5.6 the screen went blank. Also i have no more access to wp-admin, even the Visitor see a blank (white) page. I don’t know where to start the troubleshoot, ’cause I get no error. The screen went blank, and that’s it! Former problems with the provider are solved with .htaccess (for parsing php 5) and php.ini (memory Problem). But I have no idea what’s the problem with the upgrade from MB 2.4 to 2.5 is. Make sure all your plugins are turned off before switching over. There may be a conflict with a plugin that is causing some issues. have you tried version 2.6.1? this theme is better than Atahualpa. Is it possible at all with a future update or with a plug in to have thumbnail of photos on the homepage with the articles? You need put chmod 666 no ? Both will work but 666 is a bit more secure. Is it possible to tweak the excerpt length? For example the latest post will only show an excerpt of approx 30 words, leaving a lot of empty white space. ps where can I donate? I love this theme. It is a great help for those wanting a very polished and professional look for their website. I’ve just done the update to the latest MB theme. However – I can no longer change the categories on the header. Am I missing something? Where do I go to change these now? The latest version of Magazine Basic is built for WordPress 3.0. The new menu system only works with WP 3.0.
with the plugin smooth-slider ,it’s Fabulous! I upgraded to WP 3.0 and your newest version of the theme, unfortunately when I go to the widgets page I only have editing for 1 sidebar. Also, my front page layout isn’t formatting correctly even though I have it saved properly on your configuration page. It’s the default 1 story on top of each other layout rather than the 1-2-3 that I want. Also, on all my story pages it looks like my logo doesn’t properly show up? What am I doing wrong? Yet, there is one thing I can’t figure out. In the comments, there is a REPLY button. In my blog, not only that the word “REPLY” doesn’t show, but the button itself isn’t working as well. Would you please tell me what is wrong here? Thanks much! You need to turn on nested comments. Go to your WordPress settings panel under the Discussion link. Thanks C. Bavota. N, I have just subscribed to your RSS feed. Cheers! I have been using Magazine basic for many sites for a while now however after upgrading to WP 3.0 and using the latest MB version I can no longer sort the categories at the top of the page. Can I edit the code easily to make all categories show up? If so can anyone help with this please? Try using the new WordPress 3.0 menu system. Go to Appearance => Menus. Awesome thanks. I had not noticed the new menu functions. Thanks for great support and themes! c) I’d like to increase font size in the menu, haven’t found an option anywhere. You created a wonderful theme with great options. But how do I increase the point size of the body of the text? Is it possible to do that when displaying the items as single posts? Please help. Thank you. Simple and at the same time a very good theme. Very nice theme–thank you for sharing. i have to say that i am so pleased with the magazine basic template and much praise goes to bavota san for his development in making the template. i also have had satisfactory support from bavota san that has been very helpful. i am quite impressed with his work ethics as far as getting back to a client in a timely manner. i highly recommend him and his templates!! Hi, I have installed the latest version and set posts to show on front page to 18 and also set “Blog pages show at most” and RSS to 18 (i.e. wp-admin/options-reading.php) but on the index page I only get 1 page showing 18 posts. Any ideas how to get it paginating and showing the others? ah, “fixed it”. I was using the Featured Post plugin and I think the category of the featured post was removed from the index listing. Is that how it is supposed to work? Sort of makes sense thinking about it now. Hi, Love the theme! One quick question, how can I change the font on the menu? I have looked in the css file, but don’t see it. Do I have to have a premium version? The navigation menu can be styled using “.main-navigation” in the style.css file. How to get pages instead of categories below the header? and How to exclude certain pages? Go to Appearance => Menus. This is one of the best templates ever made. i use it on my dating blog and serveral other sites, thank you for your work. I would like to download MB 2.5.11 as I am comfortable with this version than the new 2.6. Can anyone help with the link to download this version. Yeah its really attractive my teacher advised me to see it. thanks a lot I will try. Thanks for the best theme, i couldn’t stop myself from donating you. That is a question for the support forum. Please ask it there. Great magazine theme, I�m using it on 3 of my sites! Is this theme SEO friendly? or I must use a SEO plugin? Lovely free theme, I’ve been playing on a test site and will definitely use it. Thank you for sharing. “Parse error: syntax error, unexpected ‘<', expecting ')' in /home/content/24/7162324/html/wp-content/themes/magazine-basic/functions.php on line 829"
After trying to fix this issue, I gave up and re-pasted in the original functions.php code. Unfortunately now the same error comes whenever I try to update the file. In fact the same error occurs if I try to navigate away from the functions.php file. At the moment I'm really at a loss as to what to do because I figured restoring your original code would do the trick. Do you have any suggestions? If anyone has had this issue; I found the answer. You need to replace the functions.php file on your ftp server and everything should work. You need to be careful when you mess around with the functions.php file because it will break your site if you make a mistake. You probably just deleted a closing bracket and that is really all it takes to cause a problem. I suggest always working on the functions.php file in a text editor outside of WordPress in case something like this happens. Hi, this theme looks great to me and I like to apply it to my blog. I have one doubt and hope you can clear that doubt. I’ve seen this theme before with another blog and the texts of that blog sometimes are shown with a normal size and sometimes with a very tiny unreadable size. What can this be? Magazine Basic does not have any theme options for font size, but you can control that by adding your own CSS to the style.css file. Magazine Premium has many design options that allow you to easily set a font, font size and even color. Thanks for your reply. It’s not about changing the size of the fonts but about a strange effect in displaying the theme. Some days a blog with this theme looks normal, but the next day the text of the blog is being displayed very small and therefor almost unreadable. I’ve searched other blogs with this theme and there it happens too, for example today. Second question is: is it possible to change all the colors of the theme or only the main background color? Pingback: ????? ?????? ????? ???????? | ???-?? Hi,I am using your theme on one of my projects. I want to edit the font (currentlt Times New Roman), I already changed it via editor but the body text did not change. Thanks!!! I like this theme very well. I have different jura Websites with law stuff, so i need clean and easy themes. thank. I have installed wordpres 3.0.5 and wondering if this theme is compatible with the latest version as well? It works with 3.0.5. A new version should be out shortly that is compatible with WP 3.1. Like your theme. iam from germany and i have to say that u done a very good job !! 666 should be enough , if u can, never use 777, its a secure reason. Nice. I ALWAYS have widget issues on WP, though, when I try to customize it. Nice theme. Looking forward to the new 3.1 compatible version. Great Theme man! Sorry Iam a newbie. Is there any way to make appear just part of my title on the front page? I have to put on a longer title but it doesn’t look good on the front page, I want the longer tittle to appear only at the browser’s bar. Thank you. Please let me know if is there any way to change the way the title is displayed on the front page. I would love to have part on the front page and all in the browsers bar. Thank you. I like it very much. The soft coloring is nice too! Any issues using this with WordPress 3.1 or 3.12? I’m still debating updating until I know all my stuff will work…thanks. It has been tested up to 3.1.2 and it works perfectly. If one is a beginner in word press and in bavotasan themes, I think the easiest way for him to make changes to posts is from the post edit section. This is possible in two ways. Theme looks great, will download and test it out. Many, many thanks! 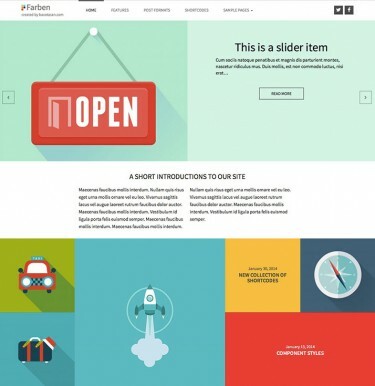 It’s a great theme – I’ve only just found it and certainly plan to use it on my next site. I like that you are quick and helpful with support here! it is an older theme, but is there any update or do you setup also custom themes / index templates ? An update is out now on WordPress.org. I’ve recommended this a few times. Great looking theme, and nice to see work from a fellow Canuck! I’m looking for a magazine theme that will also work with mobile devices. Has yours got any features for this? The theme is not optimized for mobiles devices. You might want to look into using a plugin such as WPTouch (http://wordpress.org/extend/plugins/wptouch/).